Smoke Alarms: The Immediate Importance | MA Restoration Inc.
Every year in the United States, about 2,000 people lose their lives in home fires. In a home fire smoke and gases spread faster and farther than heat. That is one reason having a working fire/smoke detector is so important. A large number of the fatal fires start at night when everyone is asleep because you are unaware of the fire until there is not enough time to escape. A fire/smoke alarm stands guard around the clock, and when it first senses smoke, it sounds a shrill alarm. This often allows a family the precious, but limited, amount of time needed to escape. About two-thirds of home fire deaths occur in homes with no fire/smoke alarms or no working fire/smoke alarms. Properly installed and maintained smoke alarms are considered to be one of the best and least expensive means of providing an early warning of a potentially deadly fire and could reduce by almost half the risk of dying from a fire in your home. The professionals at MA Restoration recommends the following with the installation of a fire/smoke detector system. A fire/smoke alarm should be installed and maintained according to the manufacturer’s instructions. When installing a fire/smoke alarm, many factors influence where you will place the alarm, including how many are to be installed. Consider placing alarms along your escape path to assist in getting out of the home in limited-visibility conditions. In general, you should place alarms in the center of a ceiling or, if you place them on a wall, they should be near the ceiling. If you do not have a smoke alarm installed in your home, go get one and install it. Install both ionization and photoelectric type smoke alarms on every level of the home. Do not install an ionization smoke alarm in or near the kitchen because it is more likely to become a nuisance during cooking. Install smoke alarms with sealed 10-year batteries. Along with the installation of the fire/smoke detectors, be sure to have a fire escape plan in place. Gather the family together and come up with the plan, get input from all family members. When fire strikes children tend to panic and try to hide from the fire. Having an escape plan in place and holding in prompt to fire drills could save the lives of your loved ones. A home fire does not have to mean a loss of life. 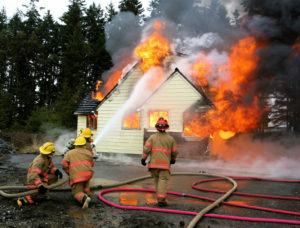 Follow these simple steps to keep your family safe during a fire disaster. If fire damage happens to your property, call the experienced and qualified professional service of a restoration company that knows what they are doing. Call a company like MA Restoration.